The PLASTIC KILLER project (LIFE12 ENV/IT/000374) is now finished. The Preparatory Actions, including “Stakeholders consultations”, “Preliminary pilot plant modelling and plant lay-out”, “Plastic Killer core components modelling and lay-out” and “Optical detection system dimensioning and design”, have been successfully concluded in 2014. The Implementation Actions, including “Installation of the units and construction of the prototype pilot plant”, “Demonstration, data analysis and optimization” and “Industrial demonstration” have been successfully concluded before the end of 2016. The Monitoring of the impact of the project actions, including “Environmental impact analysis”, “Socio-economic analysis” and “Market and financial analysis” have been successfully concluded before the end of 2016. The Communication and dissemination actions, including “Dissemination actions”, “Notice boards”, “Project website” and “Layman’s report” have been concluded in May and June 2017, as well as the Project management and monitoring of the project progress, including “Project management by PAL”, “Project management by UNIPD”, “Project management by CEPRA”, “Monitoring of the project progress”, “Networking with other projects” and “After LIFE+ Communication Plan”. All channels have been used in order to disseminate the project and its results (exhibitions, workshops, brochures, newsletters, technical publications, and a dedicated website). The purified wood, output of the pilot plan, has been used as input to produce MDF panels. First, the aesthetic results have been evaluated, then their mechanical properties have been verified by laboratory tests, and the removed plastics impurities have been collected for further recycling, with the support of local waste recyclers. After some preliminary actions done from February to April 2016 to optimize the pilot plant in order to obtain a material with the necessary purity, in May PAL produced the first MDF panels with the “purified” wood, and sent them to the laboratory in order to verify their mechanical properties. In June, PAL started a collaboration with Bipan S.p.A., one of its supplier for the wood needed for the production of MDF panels. Specific tests on this material have been done in order to realize a good quality of MDF board. In September, this activity improved a lot, and PAL, in collaboration with Bipan, worked some tons of post-consumed wood, eliminating laminate and plastic. With this material, combined with 60% of virgin wood, they produced many tons of MDF panels with a good surface quality. PAL’s technicians cut the panels in order to do some mechanical tests and verify their properties, which were compliant with the EN 622-5 standard. In October and November, after the good results achieved in the past few months, PAL and Bipan combined more tons of post-consumed wood with 60% of virgin wood, and produced some more MDF panels; the surface quality was good and their properties were compliant with the EN 622-5 standard. In the first months of 2017, some components of the pilot plant have been transferred to Bipan’s headquarters in Bicinicco (UD). The Plastic Killer machine has been moved to Bipan customer plant to repeat the industrial test “on line” conditions; it was installed at the end of January 2017, and it has been operating since the end of February 2017, with a percentage of utilization on MDF board versus virgin wood up to 50%. There has been a progressive improvement of MDF board surface quality since the beginning of the production of this mixed virgin-recycled wood board. Starting to produce in a massive way on line, we found the correspondence efficiency/surface quality was not so well defined: it depended also on the process type, on the check and safety selection devices in the line etc… In Bipan, an initial removal efficiency close to 95% allowed that some plastic pollutants came to surface: at the beginning we had some boards (8 m2 surface), inside a lot of production (about 20% of a lot) with up to 20 impurities on surface. Setting better the machine (up to 97% removal efficiency for black and white plastics and rubbers) and the whole process, we arrived at the end with no impurities on the surface, or in a reduced fraction (about 2-3%) with maximum 2-3 tolerable defects, small white melamine impurities that have only aesthetic impact, and not physical impacts as “craters”, bad for the next painting, lacquering and ennobling. The lot of boards with good surface was introduced to final treatments of lacquering, ennobling at the final user (producer of furniture small doors) with no claim or warning for surface quality. PAL performed some preliminary tests on the camera control system, focusing on the detection, identification and selection processes at various speeds of the conveyor belt, for different volumes of material. – test with virgin wood with the addition of different content of plastics. – test with recycled wood with the real content of laminated wood. Then the final machinery have been tested with both cameras (upper and lower) to verify the synchronism between them and the performance of the industrial PC in the computation. PAL tried different servers to check the time of processing and synchronism between the cameras, and bought a new one able to manage in real time the big amount of data of the two cameras. Other kind of tests have been done: tests with small lamps to reduce size and power absorption, and tests with reduced region of interest of spectrum (ROI) to increase the camera frame rate. From July to October 2016, some more tests have been done in order to evaluate the cameras detection efficiency and the ejection efficiency according to the degree of illumination. The results have improved month by month, thanks to the careful measures taken by PAL, UNIPD and Phoenix. The detection of the laminate has been improved, identifying the optimal spectral range for the laminate detection respect to the wood. Many other tests have been performed for samples with different degree of contaminants (i.e. plastic and laminate). In November, after the last modification made to the software by Phoenix, the results became very satisfactory. The cameras detection efficiency and the ejection efficiency according to the degree of illumination are now in line with the objectives. All the components indicated in the pilot plant have been constructed: Belt Conveyor, Plastic Killer, Metal Killer, Vibrating Feeder, Belt Board Conveyor, Filtering Valve, Air Recycling Cleaner, Dynascreen, Induction Grading Machine. Università di Padova collaborated to the installation and the set-up of the prototype, working mainly on the illumination system, and on the optical and spectroscopic system. The pilot plant went through a preliminary cycle of set-up tests in order to verify its functioning according to the specifications of its final executive design; all the single units have been tested before and after interconnections. All the safety and working procedures are explained in the plant manual, prepared by PAL. UNIPD started the analysis to find the best optical and detection systems, and identified a subcontractor able to work on the first one. To determine the characteristics and the specific requirements of detection, data analysis and selection system, UNIPD performed a series of spectra acquisition and analysis of different types of materials, using the spectrophotometer available at the University of Padova, and performed different analysis of the data in order to find the best representation able to differentiate the samples of different materials. They developed two techniques for the material identification; the first used the typical shape of the first wood derivative, while the second was based on the behaviour of specific sensible areas. The laboratory system was built to perform small-scale tests with a system similar to the final pilot plant. They developed a software on the MATLAB platform to perform the data analysis with the laboratory system. They developed the software that operates the selection for the laboratory system. UNIPD contributed to the optical system dimensioning and design based on laboratory tests, technical evaluation and data analysis. Laboratory tests have been carried on initially with laboratory instrumentation in order to derive characterization procedures for samples identification. The tests were necessary to identify the spectral range of interest. Once defined the spectral range, different devices (NIR Camera + NIR Spectrograph) were considered for their characteristics. With the data obtained from laboratory tests, the possible procedures for the identification of the wood and its selection were identified (in particular the detection system, the optical system, the spectroscopic system, and the illumination system). PAL modelled the main lay-out of the core of the pilot plant. The scheme of the specific components has been generated. The belt conveyor has been defined and tested with high speed (8 m/s). PAL modelled the main lay-out of the whole Plastic Killer pilot plant. This machine can separate the ferrous metals with a magnetic roll and the non- ferrous metals with eddy current. 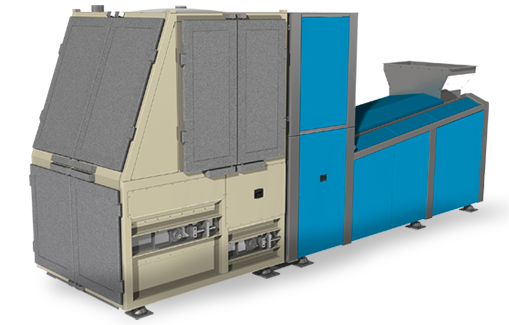 It is a roll screen machine having the function to remove the fine material and oversize. It is an aerodynamic separator that permits the sorting of wood from inert materials. It is a separator of ferrous and non-ferrous metals. 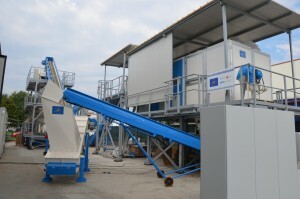 This machine permits to eliminate all the remaining pollutants, especially plastics. The Plastic Killer partners collaborated to prepare the list of all the potential stakeholders. A questionnaire with the input from all the partners have been prepared and sent to all of them. Moreover, some interviews with the main customers of PAL have been done in order to have a necessary feedback to fine-tune the pilot plant. PAL and CEPRA contacted and involved many stakeholders during different fairs (where the questionnaires and the brochures have been distributed), with one-to-one meetings. Regarding the “Stakeholders consultations”, the Consortium collected satisfactory information in order to fine-tune the pilot plant, which has been improved compared to the original proposal.